Despite its small size, Ucluelet has a surprising amount of tasty restaurants and places to satisfy your foodie cravings, whatever they may be. From fine, west coast dining, to casual restaurants to munch on pub fare, and seafood food trucks, Ucluelet’s restaurants will ensure you are full of fuel for your adventures on the west coast. 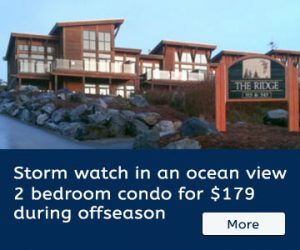 Fetch Restaurant is located Ucluelet’s Black Rock Resort. It features a large patio and dining area with unbeatable views of the west coast. While Fetch offers fancier dining, with breakfast buffet and lunch service as well, the Lounge, accessed via the lobby, is a more casual spot for drinks and pub fare. One thing you can count on by dining at the Black Rock is the best restaurant view in town. Fish and Chip lovers are in luck while visiting Ucluelet. Jiggers is notorious for offering some of the tastiest of this seafood classic on Vancouver Island. Operating out of a food truck on the main street in Ucluelet, you’ll be able to spot Jiggers by the line up! Hanks BBQ and Grill is cozy, but delivers in terms of flavour. They offer a mix of fantastic BBQ fare such as classic rib plates with mashed potatoes, as well as tasty seafood plates. Better yet, they’ve got one of the most extensive beer offerings in town, treating visitors to taps from all over Vancouver Island. What used to be Romans Pizza is now under a new name, but they serve the same food: Pizza, burgers and fish and chips. With a great outdoor patio and themed inside, Cedar Grill is an easy go-to for both lunch and dinner. For a taste of west coast fine dining, Norwoods is the place to be. Its understated outer appearance makes the classy, warm atmosphere a pleasant surprise. The wine bar is a great place to enjoy a glass or crafted cocktail from the restaurant’s extensive selection, and the rest of the space is utilized to deliver delectable dishes inspired from the head chef’s time spent traveling around the world. While on the pricy end, Norwoods does not disappoint. Just be aware that reservations are required in advance, especially during the summer. Tucked away on the outskirts of town, Solidarity Snacks is the local’s lunch go-to. While there’s only ever one sandwich, one soup and a couple salads available, everyone loves to take what they can get, because it’s all good! Add any of the delectable baked goods to your lunch special, and you’re set for the rest of the day. Thanks to its Polish inspirations, the soups and sandwiches are hearty and satisfying. They also have a variety of fresh salads, amazing goodies, and frozen products to take home with you. It’s a great find that is adored by those who know about it. Coming to the coast, it’s only natural you’ll want to get your fill of fresh seafood. Raven Lady is the place to do it if you’re a lover of fresh shucked shellfish. Operating out of a quaint food truck in a small square downtown, the Raven Lady packs their dishes full of flavour. From raw oysters by the half shell, to incredible, seafood linguine and oyster po-boy sandwiches, this is a food truck that sets the bar high. With plenty of picnic benches outside, and the oyster shell tree nearby, you somehow get the sense that they do seafood exactly how it’s meant to be.